Now “paste” the EA file [Augmenter-v2.ex4] into this folder. 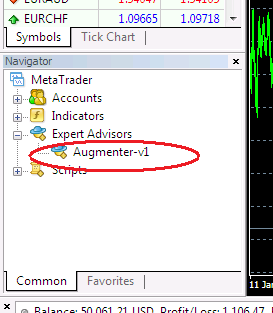 Now “paste” the both Indicators files [Augmenter-Indicator-A-v1.ex4 and Augmenter-Indicator-B-v1.ex4] into this folder. Now close MT4 terminal and then reopen MT4 terminal. If you are able to get the EA in Navigator like above, then you have successfully installed EA in your MT4. now open chart of currency pair say EURUSD on Minute-1 time frame. Set all settings as above, and hit on OK button. But if you are getting frown face instead of smiling face then hit on AutoTrading button on toolbar, now face must be smiling. All is done! Congrats! Unlock Code: If you run EA on demo account then this parameter is not required, but to use it on real money account you will need Unlock Code, and it can be obtained inside your login area. 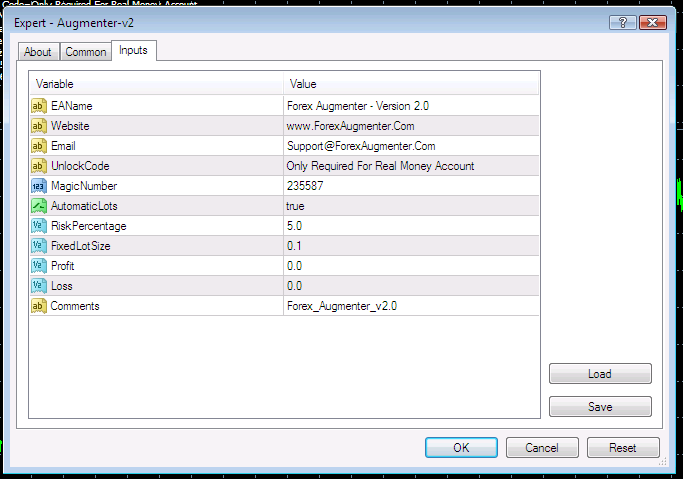 Magic Number: This number is attached to each position opened by Augmenter EA, so that EA can recognize its positions if it is being used with other EAs in same account. AutomaticLots: If it is TRUE then EA will calculate Lots size automatically. Risk Percentage: This is the percentage of Account equity. If above parameter Automatic Lots = True then EA will use this percentage to decide lots size. Fixed Lots Size: If Automatic Lots = False, then EA will use this lots size instead of Automatic Lots calculation. Profit: When all positions by EA comes in profit equal to this paramter then EA will close all of them. If it is zero then EA will calculate this value automatically, but if you set its value instead of zero then EA will use that value instead of automatic calculation. Loss: It is the percentage of Account balance. Say if it is 10 then EA will close its positions if loss is equal to 10% of account balance. If it is zero then EA will decide its value automatically. Comments: This is the text which will be attached to each position.